Matt Crafton, driver of the No. 88 Damp Rid/Menards Toyota Tundra, made his 32nd career start at Texas Motor Speedway (TMS) in Friday night’s NASCAR Camping World Truck Series (NCWTS) Striping Technology 350. Starting seventh, the ThorSport Racing driver overcame handling issues, contact with another competitor, and a battery problem early in the 147-lap event to lead the field once for 15 circuits, and contend for the race win in the closing laps. Unfortunately, a free Toyota Tundra in the final laps would force the two-time champion to lose ground to eventual race winner, Johnny Sauter with two laps remaining. Crafton would cross the stripe in the second position, his 13th top-five finish at the 1.5-mile track. Crafton, one of six NCWTS drivers to make Round 2 of the inaugural Chase, is currently ranked fourth in the championship point standings with only one race remaining in the semifinals. The top four drivers from Round 2, which concludes in next Friday’s Lucas Oil 150 at Phoenix International Raceway, will advance to Round 3, which kicks off at Homestead-Miami Speedway, the final race of the season. How was the race tonight, and are you pleased with your second place result? What happened to cause the damage to the right-rear of your truck? Due to rain on Thursday afternoon at Texas Motor Speedway (TMS), the NASCAR Camping World Truck Series (NCWTS) only had one practice session on Friday morning in preparation for Friday night’s Striping Technology 350. Matt Crafton was fourth-quick of 35 trucks that took time. Making his 32nd career start at TMS in the NCWTS, Crafton started seventh, led the field once for 15 laps, and finished second. 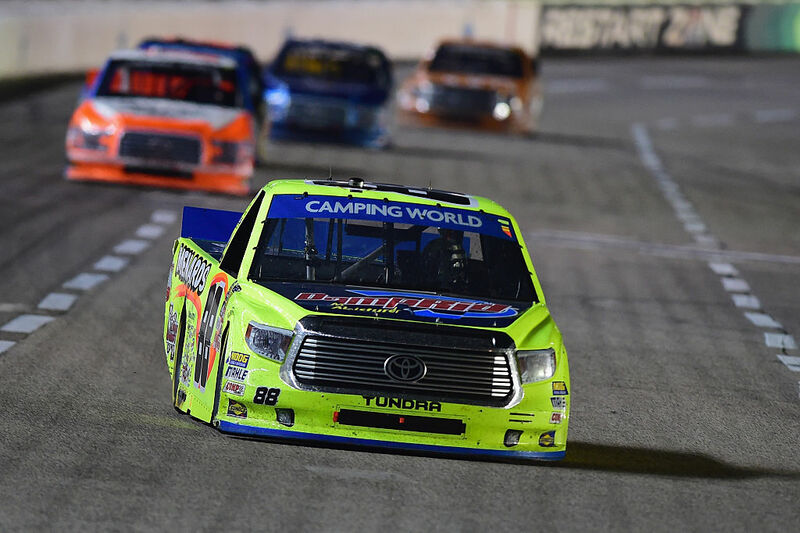 Crafton was the top-finishing Tundra driver in Friday night’s NCWTS race at TMS. In 32 starts at TMS, Crafton has led 418 laps en route to two wins, 13 top-five, and 21 top-10 finishes. In 21 starts in 2016, Crafton has one pole (Atlanta), two wins, and has led 436 laps en route to seven top-five, and 14 top-10 finishes. In 382 career NCWTS starts, Crafton has earned 12 poles, led 2125 laps en route to 13 wins, 96 top-five and 224 top-10 finishes. Crafton’s ThorSport Racing teammates finished 10th (Hayley), 12th (Abreu), and 15th (Rhodes). Up Next: The Lucas Oil 150 at Phoenix International Raceway on Friday, November 11 at 10pm ET.